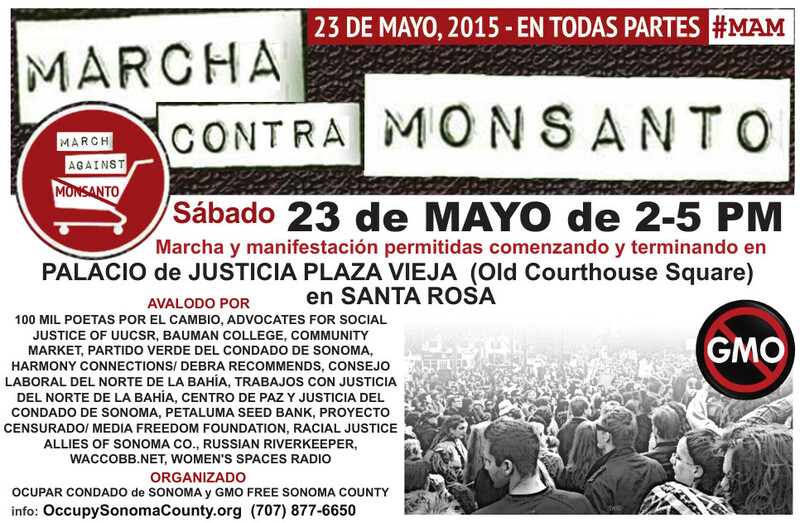 INTERNATIONAL - On Saturday, May 23rd, a broad coalition of individuals and groups will gather in cities and towns all over the world, as part of a global March Against Monsanto. The intention of this march is to raise public awareness and bring increasing political pressure to bear regarding Monsanto's corporate farming and business practices and to fight for labeling of foods that contain genetically engineered and/or modified materials. It has been estimated that 439 cities in 38 countries spanning 6 continents and will be participating in the Global March Against Monsanto for a peaceful, non-violent, informational protest. A complete list of all events can be found here. In Santa Rosa there will be a permitted march beginning at 2:00 PM gathering at Old Courthouse Square at 3rd and Mendocino Avenue and returning for a rally with speakers and musicians until 5:00 PM. This event against Monsanto's toxic practices is endorsed locally by 100 Thousand Poets For Change, Advocates For Social Justice of UUCSR, Bauman College, Community Market, Green Party of Sonoma County, Harmony Connections/Debra Recommends, North Bay Labor Council, North Bay Jobs with Justice, Peace & Justice Center of Sonoma County, Petaluma Seed Bank, Project Censored/Media Freedom Foundation, Racial Justice Allies of Sonoma County, Russian Riverkeeper, WACCOBB.net & Women's Spaces Radio with more endorsements coming in. 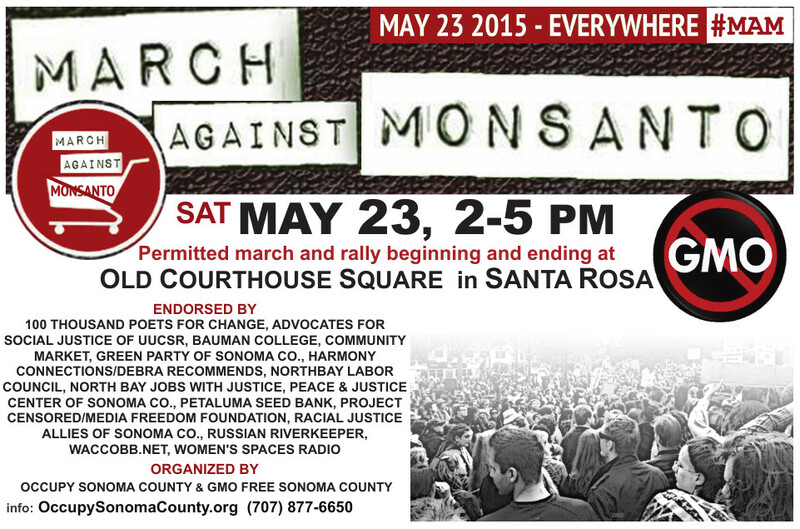 This event is organized by Occupy Sonoma County and GMO Free Sonoma County. There will be a pay-what-you-can plant sale, a free seed exchange (bring your extra seeds to share), and non-GMO food. For more information go to http://OccupySonomaCounty.org or http://www.gmofreesonomacounty.com/ or call 707-877-6650. "Monsanto is bankrupting farmers, causing soil infertility, mono-cropping, loss of biodiversity, and bee hive collapse. Furthermore, their practices pose a very real threat to organic farming and loss of native plants. It is causing dependency on a centralized food system. In aggregate, this is a recipe for global famine," warns long-time activist and member of the Gateway Greens, Daniel Romano. GMOs have been removed and banned by Austria, Bulgaria, Germany, Greece, Hungary, Ireland, Japan, Luxembourg, Madeira, New Zealand, Peru, South America, Russia, France, and Switzerland. "Monsanto does not want consumers to know what they are eating and is continuing to aggressively fight labeling of GMOs in food. This effort is now reaching even further than blocking attempts by states like California, Oregon and Hawaii from passing labeling laws. Currently a Monsanto former lobbyist is one of the corporate representatives drafting the newest and largest international trade agreement, the TPP (Trans Pacific Partnership). Non-Labeling of GMO foods is being written into the TPP." -- Barbara Chicherio, Gateway Green Alliance. "Monsanto's history includes the creation of nuclear weapons, DDT, Agent Orange, RBGH, PCBs, Aspartame, Saccharine, and numerous toxic waste sites around the world. Genetic modification of foods to contain pesticides and be resistant to massive spraying of Monsanto's own Roundup herbicide is the natural progression of this company's toxic practices that must be stopped to ensure the safety of our food, our health, and the preservation of the biodiversity of our environment." -- Stephana Morales, Occupy activist and concerned mother. For more information go to http://OccupySonomaCounty.org or http://www.gmofreesonomacounty.com/ or call 707-877-6650. Why Does Monsanto Need an Army of Mercenary Soldiers? Will Monsanto destroy Mexicos corn?